Are you single and therefore miserable? It's probably because you can't pronounce your wine names correctly. 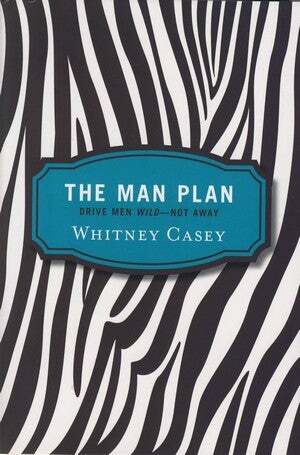 But have no fear, Whitney Casey's The Man Plan is here to help. [W]hy should you change yourself based on what men think? You are "you," and nobody should influence that, right? Wrong. Apparently, if you want a man, you need a plan. Casey structures her book around a series of stories from allegedly real-life guys about why they broke up with women. The idea is that if you simply avoid these women's mistakes, you will prevent any man from ever breaking up with you. Some of the advice is pretty predictable. Always remove all hair from your body, but do it secretly, because one time a guy named Josh saw a girl putting Nair on her face and broke up with her. Of hair removal, Casey writes, men "don't want to know about it or see it . . . ever. They just want to reach over to touch you and know that you have no body hair." Casey also tells women to keep their fridges stocked with "Beer — lots and lots of it!" and to learn to cook something called "Molly's Man-Brisket" because a guy named Mike "had grown up with a mother and a sister who could cook anything he wanted to eat, anytime he wanted to eat it," and broke up with a girl because she couldn't live up to his culinary demands. Once you've mastered brisket, Casey advises that you read up on sports, cars, sports cars, and "male movies" like The Godfather, and that you hang a TV on your wall. All this sounds like advice from the Cosmo Department of Man-Pleasing - and it doesn't help that Casey is the recipient of testimonials to her book's usefulness from people like former Cosmo editor and enemy to women everywhere, Bonnie Fuller - but wait! You must also know how to pronounce "Chablis," how to taste wine, and how to eat at a fancy dinner with his friends. This means putting your napkin on your chair when you leave the table and on the table when you are finished with your meal, never entering a restaurant with gum in your mouth, and never leaving lipstick on your wineglass. All decent advice, we suppose — if you're attending a cotillion. The Man Plan seems constructed on the basis of two completely opposite male stereotypes. One is your basic beer-loving, conversation-hating, man-brisket-eating dude (although a dude who really likes "man-brisket" might be the type of man no plan can help a woman snag), and the other is basically Henry Higgins — a priggish aesthete who wants women to be hyper-ladylike and freaks out if they chew gum. Casey seems to be saying that you can never tell whether men are going to be beer-and-beef-guzzling Maxim cliches or critical, oversensitive wine snobs — so you should just make sure you can cater to both. We wonder if maybe you should just seek out guys you're compatible with, rather than trying to make yourself some kind of perfect, unbreak-up-with-able woman who will appeal to everyone. Then again, we are only women, and according to one of the experts Whitney Casey quotes, "women don't want to hear about what other women think." So turn off your computer and go ask a man to recommend a good chablis — but you'd better bring a big slab of brisket just in case.